Tomche Shabbos offers various opportunities for everyone in the family to participate in Chessed. On the evening before deliveries take place, generally Wednesday evening, a group of ladies and girls meet at our warehouse to begin the process of assuring that everyone in our community faces Shabbos with dignity. The ladies assemble boxes, sort food items, and bag produce as necessary. The usual time is from 8.30pm until 9.15pm. To participate in ladies packing, please call Mrs. Chaya Ettlinger at 845-608-2904 or email her at ladies.tomche@aol.com. On Thursday evenings when the deliveries of packages take place, there are 2 groups of volunteers. The first group of volunteers, the packers, arrive at 8:15pm and work for about 2 hours. Everyone is welcome to assist in assembling Shabbos & Yom Tov packages during these hours. Boys under 16 though may only attend if accompanied by their father. To participate in this effort, please arrive at our warehouse at about 8:15pm. We alway need volunteers on Thursday. This group is followed by our second group of volunteers, the drivers, who arrive at the warehouse not before 10:30 pm. They are responsible for making a final inspection of each of the boxes they will deliver, after which they seal the box. They then drive to the home of each recipient, and silently deposit the box on the doorstep. 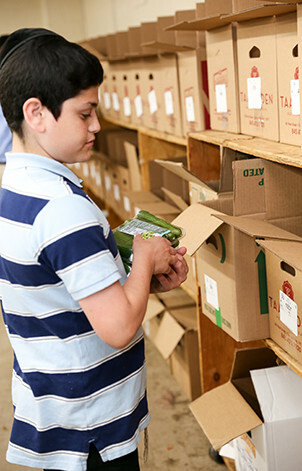 When assembling Pesach deliveries, packing takes place on a Sunday and lasts the entire day. We welcome all men & boys to give a hand or to simply visit with your children to teach them about Chessed. It is inspiring to watch the community get involved in Kimche Depische. Please be aware that traffic can become congested at Spook Rock Industrial Park. In the months leading up to our annual dinner, there are opportunities for all members of the community to become involved. Our annual dinner usually takes place the first or second Sunday in January. Please email us at volunteer@tomcheshabbos.org if you wish to assist in this major fundraising event. We need your involvement! Our widely successful supermarket card campaign which allows shoppers to add $1, $3, or $5 to their bill at checkout, can always use volunteers who visit the supermarkets regularly. Please email us volunteer@tomcheshabbos.org if you wish to participate in this effort. There are volunteering opportunities at other times other than scheduled hours. If you wish to be contacted regarding volunteering opportunities, please email us at volunteer@tomcheshabbos.org.